The crochet turning chain, usually abbreviated as tch, is a fundamental part of crochet which must be understood properly or it can cause you problems. It is the one thing that can put a beginner off, because if you get it wrong you may find your work getting wider, or narrower, as you inadvertently increase or decrease the stitches in a row. WHAT IS A TURNING CHAIN AND WHY IS IT USED? This is done by making a series of chain stitches. These chain stitches are collectively called the turning chain because they are worked when you turn your work ready for another row. HOW MANY CHAIN STITCHES ARE NEEDED? This depends of course on the height of the first stitch you are using on the next row. Generally speaking, one chain is used for single crochet (UK double crochet), 2 chain for half double crochet (UK half trebles), 3 chain for double crochet (UK trebles), 4 chain for trebles (UK quadruple crochet) and so on……. However, some people will change the number of chain used for various reasons. I like to use 2chain for double crochet (UK trebles) as my chain tend to be a bit looser than they should and it gives me a neater tighter edge. You will often see in crochet instructions the phrase something like “the turning chain counts as one stitch”. This is often where a beginner goes wrong..
You can either regard the turning chain as representing one stitch, or you can totally ignore it and don’t count it when you count the number of stitches in a row. Not counting it as a stitch is easy enough. When you get to the end of a row and come to the turning chain of the previous row, just totally ignore it, make your turning chain for the next row and then work into every stitch. If you count the turning chain as a stitch, then when you get to the end of a row, you must work a stitch into the top chain of the turning chain of the previous row. Then you make a turning chain ready for the next row and turn your work. However, at this point, you must remember that because this turning chain that you have just done is counted as a stitch, you must not work into the first stitch of the previous row. If you do work into the first stitch, you will have in effect worked it twice and will end up with one too many stitches as you will also be making a stitch into the turning chain at the end too. Your work will get wider and wider with each row. Conversely, you could get a bit mixed up when you don’t count it as a stitch and still miss out the first stitch on a row and forget to work into the turning chain at the end. In this case your work will get narrower and narrower as you miss a stitch each row. 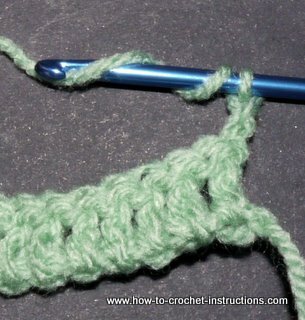 Generally, most crocheters, when using single crochet (UK double crochet), do not count the turning chain as a stitch, but do for all other stitches. And generally speaking, I do too. When you do count the turning chain as a stitch it leaves a slight hole, yet if don’t, you end up with a wavy edge where it sticks out on every other row. It depends what is more important to you. However for me, the hole is more marked when using half double crochet (UK half trebles) so I tend to go more for not counting it as a stitch in this instance.